The 9th Sangguniang Panlalawigan (2016-2019) formally began its work as the legislative arm of the Provincial Government of Bulacan with the holding of its Inaugural Session last/on July 7, 2016 at the Senator Benigno S. Aquino, Jr. Hall which culminated with the “State of the Province Address” (SOPA) delivered by Provincial Governor Wilhelmino M. Sy-Alvarado. The historic event, witnessed by national and local officials alike, as well as by other dignitaries coming from various sectors of the society, the media people, PGB department heads and employees and the families of the members of the legislative body, saw the 13 members of the Sangguniang Panlalawigan, headed by Vice-Governor and SP Presiding Officer Daniel R. Fernando, now on his third term, entered the august hall one by one as they were being introduced by SP Secretary Ma. Perpetua R. Santos, amid the cheers and applauses by the audience. The other members of the 9th Sangguniang Panlalawigan, a mixture of veterans and experienced and young blood, were: First District: Board Member Therese Cheryll B. Ople (third termer), Board Member Felix V. Ople (third termer) and Board Member Allan P. Andan (first termer); Second District: Board Member Enrique V. Dela Cruz, Jr. (third termer) and Board Member Ma. 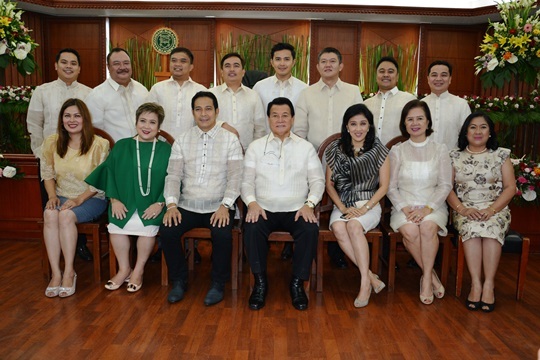 Lourdes H. Posadas (first termer); Third District: Board Member Rino V. Castro (third termer) and Board Member Emelita I. Viceo (first termer); Fourth District: Board Member Alexis C.Castro (first termer), Board Member Allan Ray A. Baluyut (second termer) and Board Member Perlita A. Delos Santos (first termer); Ex-Officio Members: Board Member Josef Andrew T. Mendoza and Board Member Mark Cholo I. Violago. After the introduction of the SP members, Vice-Governor Fernando formally opened the session. The members of the 9th SP then took turns going to the rostrum to deliver their short speeches expressing their thoughts and expectations for the new Sangguniang Panlalawigan. After their speeches, a short break was called by the presiding officer. Then Board Members Enrique Dela Cruz, Jr., Therese Cheryll Ople and Felix Ople left to fetch the provincial governor from his office. Upon arrival of the governor, the session resumed with the vice-governor taking the rostrum to deliver his own message. For his part, the Presiding Officer expressed his appreciation and gratitude to everyone and called on his colleagues in the Sangguniang Panlalawigan to forget their political differences and unitewith him in the challenging tasks of enacting significant legislations to complement and support the Governor’s thrust for the next three years. After the vice-governor’s message, Governor Sy-Alvarado took the rostrum for his much awaited “State of the Province Address” (SOPA). In the first part of his SOPA, the governorreported the accomplishments of his administration for the last six years highlighted by the personal appearances of some of the beneficiaries who came from the different parts of the province. In the latter part of his talk, the governor discussed his administration’s thrust for the next three years which include the Bulacan Bulk Water Supply Project, the Quezon City-Dingalan Road Project, the North Luzon Expressway East Alignment (NLEx East), the Clean-up of the Marilao-Meycauayan-Obando River System (MMORS), and the establishment of Bulacan Technohub and Innovation Center, among others. After the Governor’s speech, which was punctuated by a loud applause from the audience, greetings and picture-takings followed.